“Studying new ways and means to communicate the Gospel of mercy to all people, in the heart of different cultures, through the media that the new digital cultural context makes available to our contemporaries is something that is “very much in my heart.” (Pope Francis). Pope Francis has called the internet, text messages and social networks ‘a gift from God’ and the Conference of Religious, in line with its strategic objective to have a more visible presence and a stronger voice, has launched social media accounts and redesigned its website. Through Twitter and also Instagram (- a photograph and video sharing social network), the mission of religious communities in England and Wales will be highlighted and promoted. This redesigned homepage aims to be a showcase of the work of religious and allow individual religious to share their thoughts in the newly created ‘blog’ section. The power of these new methods of communication can be seen in Pope Francis’ engagement with the digital sphere. On Instagram, he has 5.7 million followers. His @Pontifex Twitter accounts have reached more than 40 million followers in nine different languages. The Vatican Secretariat for Communication has described the accounts as an essential way for Pope Francis to personally connect with people around the world: “Every day, through his tweets, Pope Francis makes himself available to men and women through social media, at times offering a spiritual thought,” the Secretariat has said, “other times sharing with his followers a reflection on events of great significance for the international community.” For instance, at the launch of his environmental encyclical, Laudato Si’, Pope Francis sent out nearly two dozen tweets over six days, calling for immediate action on climate change – with the notably pithy tweet, warning that the earth was beginning to "look more and more like an immense pile of filth." The Conference of Religious has added its voice to concerns expressed by Cardinal Nichols about the treatment of asylum seekers in the UK. The President of the Conference of Religious of England and Wales, Fr Paul Smyth, who is also President of the project ‘Solidarity with South Sudan’ - which has communities based in South Sudan made up of members from 19 different Congregations - has called on religious communities in the UK to copy this model of collaboration, in the face of emerging problems. ‘Solidarity with South Sudan’ has the objective of helping this country established in 2011, to rebuild after years of civil war. Its mission is empowerment and sustainability. It trains local people to become teachers, nurses & midwives as well as pastoral workers and catechists to support those traumatised by the conflict. In addition, there’s an agricultural project to produce food and re-introduce farming skills that have been lost due to people being displaced from their land and homes. The award was given for her achievements and services to end modern slavery. Sr Imelda heads up a network of European Religious fighting trafficking and exploitation - RENATE. She became President of RENATE after more than 11 years working in Albania where the IBVM founded an NGO called Mary Ward Loreto. On Twitter, the Archbishop of Westminster, Cardinal Vincent Nichols, who is president of the Santa Marta Group which works to prevent human trafficking and modern slavery, offered congratulations: “Sister Imelda, and her many colleagues in other religious Congregations, have long been champions in this important work. Her hard work, determination and her compelling advocacy constantly bring support and encouragement to all involved in this struggle, myself included." The Mary Ward Loreto NGO in Albania has led to numerous projects being set up. One of these is called Mary Ward Loreto Women in which six Mary Ward centres have been established to work on prevention, advocacy, awareness, and rescuing of women. The centres have worked with 3,000 women, and set up 16 economic empowerment businesses. They also have a project for men aimed at changing patriarchal culture and promoting gender equality. The work with men is to address depression, anger and fear, drug and alcohol addictions related to unemployment and their changing role in society. Mary Ward Loreto is also promoting ethical and democratic best practice in Albanian schools and in all of the projects. Sr Imelda recalled how it all started through a conversation with the Bishop of Tirana who pointed out that speedboats were being used to smuggle teenage girls into Italy. Years later, the work in Albania is still growing – a new shelter is about to be opened in the north of the country and Sister Imelda is still very active in the field; the conversation for this article had to wait until she had returned from a trip into the mountains. The nuns who opened their doors to a camera crew for the making of the recent reality television programme ‘Bad Habits, Holy Orders’ say they’ve been overwhelmed by the response of viewers both in the UK and internationally. Speaking from her Convent in rural Norfolk, eighty-five year old Sister Thomas More said the Sisters have been inundated with letters and emails – all positive - and that some people have come back to Church after viewing the show. Sister Thomas More, who recently celebrated her diamond jubilee of religious life, said that when the Convent was first approached about allowing the cameras in she wasn’t at all sure it was a good idea: “I was worried. The younger sisters were more enthusiastic. But we talked it through and decided to go for it. It wasn’t particularly easy having the cameras around us morning noon and night. They weren’t inside our enclosure but they were in the Chapel and the common room.” The crew and producers even lived in the Convent for the duration of filming. “There were remarks about the lack of mirrors in the bedrooms!” she laughs. That the programme impacted for the better on the lives of the young women is undeniable. “The experience led them to look at themselves and what they were doing. Not just their drinking. 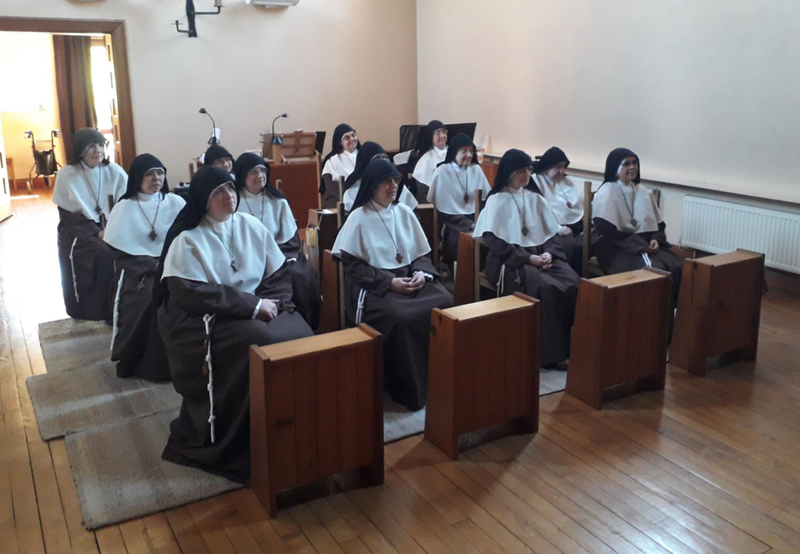 They’ve also come to see that there’s more to life.” Several have been reconciled with family members they’d fallen out with and the Sisters were delighted that a couple of them came back to the Convent to speak at a recent youth gathering. The bond has been maintained, with one of the younger Sisters keeping in touch with the young women on Facebook. Sister Thomas More can’t hide her delight that the programme has led to the sisters expanding their ministry as well as their public profile. For instance some of them were recently invited to be involved in the running of an auction in aid of homeless young people. They’ve also spoken at a school in London on vocation and an invitation has just come in to speak in the Netherlands. Sr Imelda heads up a network of European Religious fighting trafficking and exploitation - RENATE. This day flows from the broader culture of vocation, and is when the universal Church asks the Lord to send more labourers to the harvest. · Parallel Paper Sessions presented by postgraduate students, early career scholars and established academics on areas relevant to Catholic theology/ Catholic studies. limited and we anticipate this will be a very popular event, so early booking is strongly recommended to avoid disappointment. This coming year is the tenth year of Dementia Prayer Week - we like to refer to it as a Decade of Dementia Prayer - will you join us? Thank you for all your support to date. May you be inspired and comforted by the words of Bishop David McGough in March 2017, "During this week we remember especially the often forgotten pain of those suffering with dementia, and those who care for them." In his message for the first World Day of the Poor, to be celebrated on 19 November this year, Pope Francis asks all of us, whatever our means or background, to unite in love, in acts of service to one another and in genuine encounter.